The California Tower at Balboa Park will close for repairs to bring it up to code for earthquake safety. 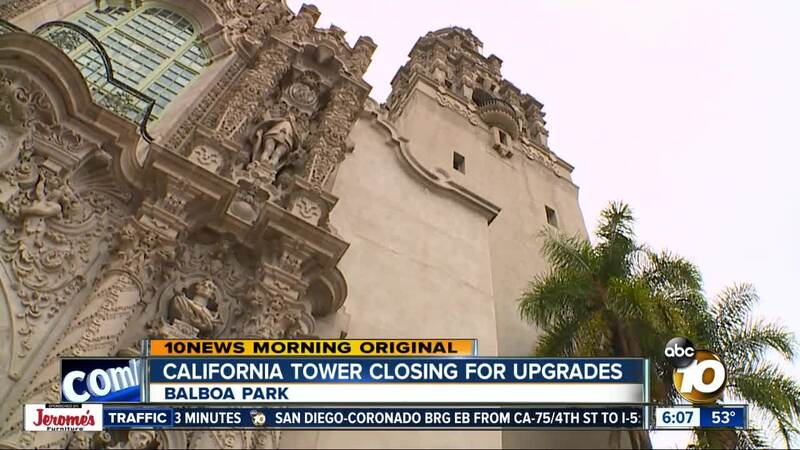 SAN DIEGO, Calif. (KGTV): Visitors to Balboa Park only have a few days left to climb the iconic California Tower, before it closes for an earthquake safety upgrade. The tower will close for 7-10 months, starting on February 18th as city crews bring it up to current safety codes. "The building itself is very sound and very safe," says Museum of Man Marketing Director Shannon Fowler. "But it was built in 1915. So it needs some help, some renovations to bring it up to those building codes." City documents say the seismic retrofit project will thicken the concrete walls of the tower, increase the foundation and replace steel beams in the top levels. It will cost $5,748,550, with the money coming from the City and FEMA. Until the 18th, people can still take the tour and climb the 125 steps to the tower's viewing deck. Tickets are available here. "There's nothing else like this in Balboa Park or in San Diego," says Fowler. Construction will also have an impact on the rest of the Museum of Man, as some exhibits will have to be closed for a short period of time throughout the project. Meanwhile, the historic photos of the tower and the electric carillon that plays hourly chimes will be put into storage. An interactive exhibit about the tower will also be stored during construction. To make up for the inconvenience, the museum says their popular "Cannibals" exhibit will now be included with general admission tickets. Visitors used to have to pay extra to see it. The tower was built in 1915 for the Panama-California Exposition at Balboa Park. It was closed for nearly 80 years before reopening in 2015. The Museum of Man says more than 128,5000 people have been on the tour in the past four years.